Some people love to flock to the malls to get their Christmas shopping done and some thrive under the stress of last minute shopping. Me? Not so much. Thankfully I have just the thing to make your Christmas shopping less stressful and will give you the nudge you may need to get started now so you're not trying to finish everything at the last minute. It's my 2014 Christmas Gift Guide and it's just has helpful as Pinterest. Because, like Pinterest, I've scoured the best of the best gifties and put them all into one handy guide. Sound good? I thought so. Let me give you a tour of the guide and let you take it from there. The shops are listed in alphabetical order. To help you know where to start, I have a brief description of what each business sells, some of my favorite items (with links to those items), coupon codes (if applicable), price range of their products and shipping information. This guide will be available for you from now until January 16 and will be posted at the top and side of my blog for easy access. I'm thankful for the opportunity to present these companies to you and I hope that my selections will help you choose gifts for those in your life. This is my favorite gift guide yet! 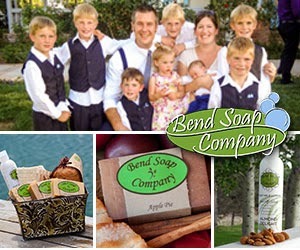 Bend Soap Company is a precious, family-run business based out of Bend, Oregon. The Bend Soap Company began as a result of husband and wife team, Dwight and Marilee coming up with a solution to help one of their sons who was struggling with severe eczema. After doing some research, they started making natural goat milk soaps and lotions with pure, wholesome ingredients. They saw a dramatic difference in their son's skin and before they knew it, others were asking to buy their soap too! Their products are made with fresh goat milk from their farm and wholesome, nourishing oils and essential oils. Their products are fabulous for sensitive skin and eczema. 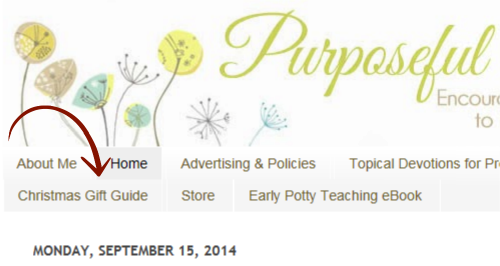 In browsing the website, I couldn't help but notice the care put into the Essential Gift Basket. It comes completely ready to present as a gift since it includes one of two beautiful tins (your choice in style). Each gift basket holds 3 goat milk soaps and a Milk Bath in a Bag (I've tried this and it is so relaxing!). Also included is an 8 oz. bottle of their velvety, moisturizing goat milk lotion in the scent of your choice (I'd pick either coconut or orange!) the wooden soap dish, lotion pump, and super lathering loofah. This is a gift anyone would love to receive! Forever Living is a company that is new to me, but one that provides aloe-inspired products for your health and beauty. When looking over the Forever Living website, I noticed the Sonya® Skin Care Collection. This kit focuses on rejuvenating the skin--something I wish I'd done years ago! This kit contains five products including Aloe Purifying Cleanser, Aloe Refreshing Toner, Aloe Nourishing Serum, Aloe Balancing Cream, and the Aloe Deep-Cleansing Exfoliator. Or, If you are looking for a skin moisturizer and conditioner, you might consider the Propolis Crème. It is a blend of stabilized Aloe Vera Gel and Bee Propolis but also includes Chamomile to aid in skin care and Vitamins A and E to aid in the natural skin-conditioning process. For a few stocking stuffer ideas, you might like the Forever Bright Toothgel which is suitable for all ages and does not contain fluoride or the Heat Lotion for someone in your life that suffers from achy joints or perhaps sore muscles after working out. 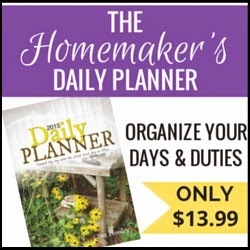 The Homemaker's Daily Planner is a wonderful gift for any homemaker whether single or married. It is a daily planner that not only helps you get your life organized, it inspires you along the way with great quotes or passages of Scripture. I have been using one of these planners for a couple of months now and wonder why I didn't get one of these years ago! It has been so wonderful having all of my to-do lists in one spot instead of on random scraps of paper. I am not a techy person so I do not have calendars or to-do lists on my phone. I prefer something I can write in and love the satisfaction of seeing projects crossed off. The Homemaker's Planner has mini calendars for at a glance dates, monthly calendars and my personal favorite, weekly calendars. There is also a designated section for task lists, projects and events, information and even perforated grocery lists. I used a planner daily all throughout college and in my career as a teacher. I don't know why I never thought to get a planner for homemaking, but I'm sure glad I have one now! Having something as simple as a beautiful planner designed just for a homemaker can be truly satisfying and helpful. It Works! offers natural tightening, toning and firming options as an alternative to cosmetic surgeries or constricting shapewear. It works! products include body wraps, stretch mark cream, greens, vitamins, stress relievers and more. One of the more popular items from It Works! that are quite the buzz these days are the body wraps which target different trouble spots on the body. The results look amazing and I'm looking forward to trying these in the future. The other popular item that my neighbor first introduced me to were the Greens on the Go™. These convenient little packs can be added to a 16.9 fl oz water bottle and help alkalize, energize and detoxify the body. Greens on the Go™ offer probiotics, plus 8+ servings of fruits and vegetables and a blend of 38 herbs and nutrient-rich superfoods. I'm also intrigued by Confianza, a special blend of herbs, because it is a natural way to increase energy levels while also reducing stress and fatigue. I'm someone that can't handle the affects of caffeine from coffee and do not drink caffeinated pop on a regular basis so I would be interested in seeing how this works. This would be a great gift for anyone you know that could use an energy boost! Whether you're looking to lose weight, assist your nutritional intake, aid your digestive system, or reduce stress, It Works! has something for you or anyone else on your gift list. Contact Staci for more information. 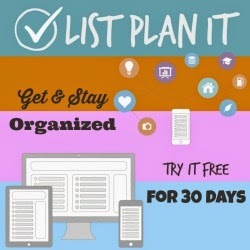 ListPlanIt has hundreds of lists to help you get and stay organized. Members can create and manage these lists from any device, at home or on the go. ListPlanIt has twelve categories and within each category are a number of lists that members can choose from. Categories cover topics such as meal planning, moving, home management, student planning, holidays and more. Plus, they all come with automatic backup so your lists are never lost. Members also have access to over 700 printable lists. Want to give it a try? ListPlanIt will let you join for free for 30 days. Be sure to check out Jennifer's blog for organizing inspiration, tips and more. Plus, she has several ebooks to you give you the confidence you need to stay organized during the holidays and over the summer. 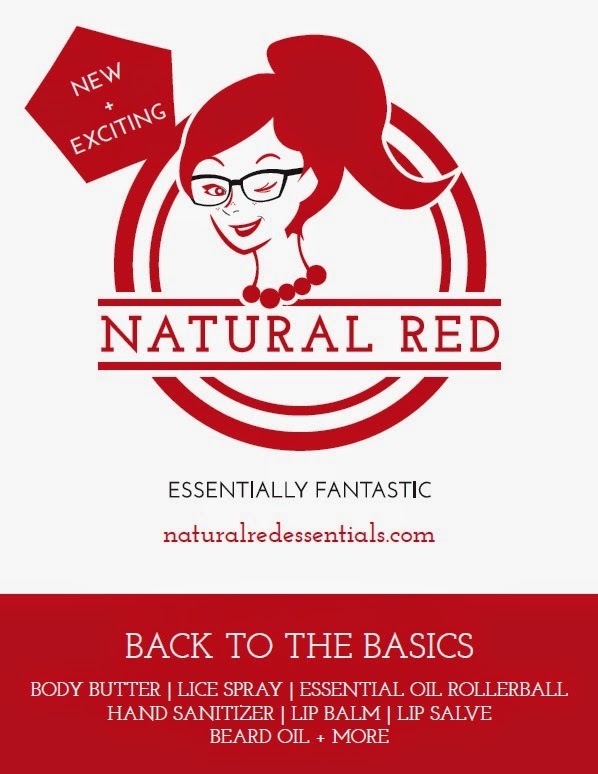 Natural Red offers a variety of natural products with the added benefit of essential oils. You can find products including Lice Prevention Spray, Hair Detangler, Chapped Skin Balm, Hand Sanitizer, Stretch Mark Prevention Cream, Nursing Mama's Balm, Lotion Bars, Body Butter, Chapstick and more. And as an added bonus, each product is cleverly labeled with a product description that's sure to give you a chuckle. My favorite picks would be, hands down, the Knots So Bad hair detangler for my daughter. She has such beautiful red hair, but neither of us enjoy combing it because she is sensitive about tangles. I'd love to have a natural detangler for her that would work well without the added chemicals. I'd also love to try the Raw-k and Roll On Chapped Skin Relief for our son who perpetually has dry, cracked hands from the fall until spring. I have yet to find something that really addresses it for him since he struggles with it more than the rest of us. I'm sure he'd love something like this in his stocking for Christmas! Nick's Sticks is a grass roots business that makes the best beef sticks ever. Seriously, we love these. We have gotten them for our family's stockings the last couple of years and I would hate to see the sad faces if we don't have them in the stockings again this year. I'm a big fan of "Breakfast in a Stocking" because it's practical and it allows us to splurge on fun, healthy eats that we don't normally get. Besides, everyone's always hungry on Christmas morning but Momma doesn't always want to take the time to make breakfast right off the bat. Not to mention, how can we not give our kids grass fed beef sticks when that's what they want instead of plastic stuff that will break in a week?? We steer clear of conventional beef sticks, but these ones I'm happy to let our kids chow down on. These sticks are made from 100% grass-fed beef (or you can get free-range turkey) and are seasoned with Redmon organic salt. Norwex provides you the opportunity to equip yourself with cleaning products that are chemical free. When reading about Norwex, I was pleasantly surprised to find that using the Norwex Cleaning System could decrease my cleaning time in my home by 75% or more. For a girl that doesn't enjoy cleaning, that sounds pretty intriguing. But what really resonated with me even more was learning that the average household spends about $600-$800 a year on chemical cleaning products and supplies. By switching to Norwex, you can save up to 90% on this aspect of your budget. That's a great option that's helpful not only to your pocketbook, but also your health. As I browsed the online catalog, I looked for things that I would personally enjoy using in my own home. Of course, I was instantly drawn to the kids' section and spied this Hooded Towel for Babies. I love that it would quickly absorb water from my baby's skin and that it has the benefit of the hood to help hold the towel in place. As a busy Momma, the Makeup Removal Package would allow me to quickly and easily remove my makeup from my face and delicate eye area with just water! And who wouldn't want a little Marine Organics Day Cream for more youthful looking skin? There are so many products available from Norwex that I have just scratched the surface. If you're looking for natural cleaning options for your home or personal care, be sure to check out Norwex. 9 by Novogratz is a family run business started by a husband and wife design team. 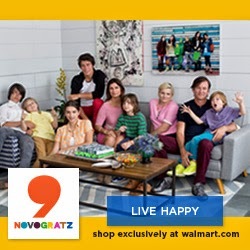 Their eclectic family-styled bedding, furniture and bath products are available exclusively at Walmart. Parents of seven children, Cortney and Robert use their family's travels and tastes for their product inspiration. Their Kaleidoscope Bed in a Bag Bedding Set, for example, is a reflection of their family vacations to Brazil. My personal favorite is the Mainstays Bed in a Bag Bedding Set. It is bright and cheery and is an easy decorating winner, especially for someone like me who struggles to pull patterns together. If you're looking for a more bold and graphic print, the Sweet Dreams Bed in a Bag Bedding Set is a versatile set for toddlers to teens. Standing behind their motto that "great design does not have to cost a fortune," all of 9 by Novogratz bedding products are reversible to help you create a functional, yet sassy décor without financial regret. 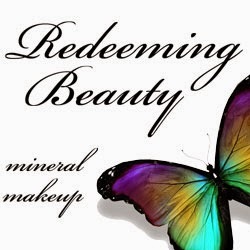 Redeeming Beauty offers natural, hand-crafted mineral makeup, sugar scrubs, perfume oils, dry shampoo and nail lacquer. For a list of what is NOT in Redeeming Beauty's skin care line click here. I have been using Redeeming Beauty's mineral powder eye shadow for several months. I really like the Marshmallow as it gives a quick "pick me up" to my eyes. I am also very interested in trying the Vanilla Rose Mineral Powder Foundation. I have been on the hunt for a toxin-free mineral powder foundation to use and think I have finally found one! I'm also very intrigued by Redeeming Beauty's perfume line. Having given up perfume several years ago due to allergies of one of our children, I've never gone back to wearing it. It is something that I miss though and having a perfume that is not going to harm my health or irritate those around me would be a welcomed addition to my daily routine. Husbands, do you know that your wife would love makeup free of toxins, but aren't sure what colors she would like? Then you'll be happy to know that Redeeming Beauty offers gift certificates. Your wife will be thrilled with a shopping spree that allows her to pick out makeup that won't be harmful to her health. And bonus: All orders come gift wrapped! 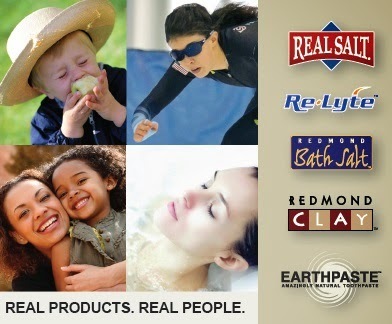 Redmond Trading Company is a favorite in our home and is a company we support on a regular basis. We love their seasoned and non-seasoned Real Salt which is truly an all-natural sea salt (Did you know many other sea salts contain sugar?). In fact, Real Salt is a fantastic gift option for someone who has high blood pressure because they can have the salt without the harm that regular table salt causes. I also love having the Bentonite Clay on hand to occasionally add in smoothies, for upset tummies, and most recently, for a severe burn one of our children received. Their Redmond Clay facial mud is honestly, amazing. I noticed my skin was smoother after using it and it always helps clear up trouble spots. And after dealing with numerous cavities in one of our children, we switched to Earthpaste about 6 months ago and have not had any new cavities since. Sweetbottoms Baby is your one stop shop for natural parenting products like eco-friendly toys, cloth diapers, baby carriers and more. This boutique has been a personal favorite of mine over the years when it comes to cloth diapers and I especially love my Gypsy Mama's Water Wrap. I have used several baby carriers over the years but my favorite is the Ergo Baby carrier. Sweetbottoms Baby has a wonderful selection of not only these carriers, but several other styles as well. If you're looking for some stocking stuffers for your older kids, I like to give mine their own alcohol-free hand sanitizer to toss in their bags or purse. But if you're looking for something a little more on the cute side for younger children's stockings, there are several rattles, teethers or educational toys that are just the thing! This post contains affiliate links for my ebooks for which I will earn compensation should you choose to make a purchase. These are paid sponsor posts but all opinions are my own. I am disclosing this information in accordance with the Federal Trade Commission’s 16 CFR Part 255, Guides Concerning the Use of Endorsements and Testimonials in Advertising. 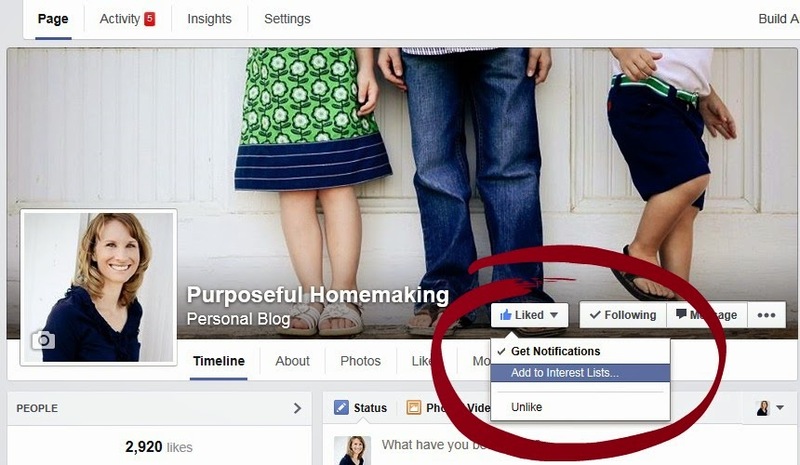 Thank you for your support of Purposeful Homemaking. It's great to find another Michigan blogger doing the #Write31Days challenge!!! I hope you enjoy the series. :) Thanks so much for stopping by! !